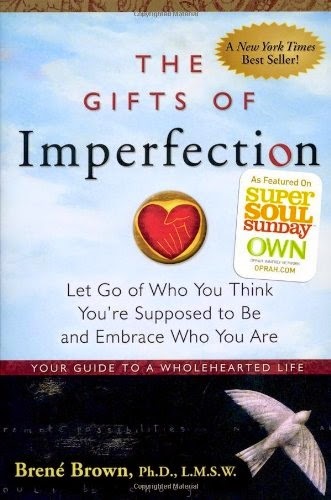 Behold & Reflect: Reflections on Brene Brown's "The Gifts of Imperfection"
Reflections on Brene Brown's "The Gifts of Imperfection"
This little book caught my attention with its lengthy title, The Gifts of Imperfection: Let Go of Who You Think You're Supposed to Be and Embrace Who You Are: Your Guide to a Wholehearted Life. I'd heard that Brene Brown conducts thousands of interviews to find common themes and patterns among those that lead what she calls "wholehearted" - fulfilling, happy, intentional, present lives- and those who don't. This book presents sage advice teased out of all these interviews, tightly packed into 10 "guideposts" on the path to wholehearted living, including self-helpy suggestions like cultivating self-compassion and creativity, Christian virtues like gratitude and joy and somewhat surprising suggestions like taking time to laugh, sing and dance each day. Though it's not a parenting book, Brown uses examples from her own life and her sometimes fragile balancing act as a working mother. I found myself contemplating my parenting more than any other aspect of my life as I read, largely because I see my own worst behavior in my children on those particularly imperfect parenting days. An idea shared by many authors of parenting advice books, Brown believes "where we are on our journey of living and loving with our whole hearts is a much stronger indicator of parenting success than anything we can learn from how-to books." "In another very unexpected discovery, my research also taught me that there’s no such thing as selective emotional numbing. There is a full spectrum of human emotions and when we numb the dark, we numb the light." "At first it seems like conforming and competing are mutually exclusive, but they’re not. When we compare, we want to see who or what is best out of a specific collection of 'alike things.'" "The comparison mandate becomes this crushing paradox of “fit in and stand out!” It’s not cultivate self-acceptance, belonging and authenticity; it’s be just like everyone else, but better." "There’s no such thing as creative people and non-creative people. There are only people who use their creativity and people who don’t." "The only unique contribution that we will ever make in this world will be born of our creativity." "If we want to live a Wholehearted life, we have to become intentional about cultivating sleep and play, and about letting go of exhaustion as a status symbol and productivity as self-worth." I liked the suggestions in this book. It's easily digestible, and most of the guideposts resonated with me. However, I found myself wondering "how to I actually do this? And how do I even remember to do all these things? And if I did do all these things, wouldn't I be perfect?" throughout much of it. While Brown's personal experiences were helpful and humorous, I craved some of the contents of those thousands of interviews with these mystical "wholehearted" people. I wanted to hear more of those success stories, to peer into their lives and see the guideposts in action. Obviously, this would be a different book altogether, and my craving probably couldn't be satisfied, as the contents of Brown's interviews are probably confidential. I don't doubt that she did find these patterns of behaviors and thoughts through out her careful research and analysis, but seeing some of the raw data would have been helpful to me. Perhaps I need to start collecting some stories myself.